Note that the explanatory captions on this video are only visible on a computer and not on a mobile device. If you watch on a mobile device you will not understand the video. Since I made this video, the cycle-path along the canal has been completely resurfaced to a very high standard. I made this video a few days ago, showing the first four km of my commute by bike next to the route which I'd have to take if I drove to work, or indeed if I insisted on cycling on the road which I'd use to drive. The map shows the bike route in red and the car route in blue. The five sets of traffic lights which are on the car route are shown with a black background. The white background traffic light is on the bicycle route, but this defaults to green for bikes (all three of those include similar maps showing bike and car routes to different destinations). That single traffic light is the only which exists between my home and work 30 km away. However, if I was to drive then after coming off the motorway in Groningen there are several other sets of traffic lights waiting for me before I get to work. Cycle routes are more direct than driving routes. That's the case whatever direction we set off in. This is about the best possible case for driving, but cyclists are still prioritized such that it's possible to come close (and perhaps "win" if parking at the far end is included). I've featured several examples before of where cycle routes are more direct than driving routes. 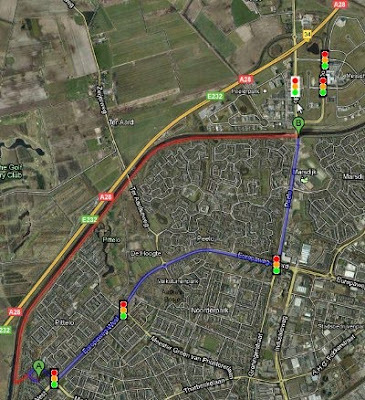 There are also many examples of where Dutch cyclists get to dodge traffic lights on this blog. Unfortunately, the video is rather small inside the blog page. You may prefer to watch it directly on youtube. Over here, in most cases, we must build the engineering and prove that the 85 percentile has been reduced to around 20mph before we can officially change the speed lower. In many states a city can't even lower a speed limit to below 30 unless its a school zone, because it is set at the state level... Oregon is working on a law that will allow cities (in state) to reduce their road speed in certain neighborhood environments, which is a huge step! @David - is the A to B the video? Or does it go beyond? I got a bit confused how to match it up. The car route appeared to go to the 5th traffic light, i.e. beyond 'B'. @John - in itself the 85th percentile is a good thing. You shouldn't just change a speed limit and expect it to do any good. To do it properly you should change the structure such that people are led into going slower, they feel too fast when going over the limit. A speed limit without the changes means the limit is unlikely to be followed even by those not intending to break the law. John: Crossings are almost always like that. It's obvious that cars are crossing cycle paths, both in urban areas like this and out in the countryside. The first photo at the first link there is of the same junction. Neil: The A to B is as in the video, but the car video goes on a bit longer. Unfortunately the battery ran on the bike so it stopped a little short of where I'd originally intended to go - past the white traffic light to the motorway, 5 km instead of 4 km. You can see most of this section in another video. You're giving the car more credit than it's worth in that video by doing it at noon. At any other time during daytime it'd be more congested and thus slower and less pleasant. Re: speed limits, there's probably a good blog post to be made about the current design philosophies — speed limits, width, surface, chicanes — for various types of road. I tried finding out more about the official government guidelines (which are generally followed to the letter) but CROW, the institute which publishes them, charges significant amounts of money for them (up to €312 per publication). Anonymous: You're quite right. It's actually a very good route for the car even at busy times, because while there are traffic lights, it's possible to drive quite quickly in between them. Going from here into the city I think a bike would almost always win. I took photos a few days ago of bits of main road in the countryside with a thought about writing about the way these are designed. It demonstrates how far that we have to go here in the Washington DC area that I found this kind of thinking difficult to grasp at first. Driving to my office would be 12 km by car, mostly on a highway that is closed to bicycles. Riding my bike is 15.25 km so noticably longer but I consider myself lucky since it is almost entirely on so-called bike paths that run along parallel to streams or the Potomac river - only the last 2 km are in the city on surface streets with cars. Nevertheless my actual commute time is the same as taking the bus and two subway trains that would be required using public transit and better than if I drove in rush hour and paid to park, then walked to my office. Still, efforts to improve the bike path network do lead to some shorter routings - recently my commute was shortened by 3/4 km when two bike bath segments were connected by a simple underpass under the highway that had been an obvious need for many years - but I am pretty sure the motivation was to move cycles off the roads (where they were) and not to shorten the travel distances, or perhaps a bit of both. If you use the Google maps "bike option" they are inevitably longer - sometimes much longer - than the suggested car routing.